Iodine Global Network (IGN) - 2. Why do we need iodine? Iodine is an essential dietary nutrient for humans because it is a key component of the chemical structure of thyroid hormones. We need iodine because thyroid hormones are essential to human life. 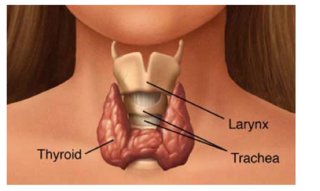 The thyroid is a butterfly-shaped gland in the lower front part of the neck. It produces two hormones (thyroxine known as T4, and triiodothyronine known as T3), which have important functions throughout the body. The hormones are released into the bloodstream and carried to target organs, particularly the liver, kidneys, muscles, heart, and developing brain, where they influence different chemical reactions, usually involving manufacture of proteins. Our bodies must have adequate levels of thyroid hormone, and thus iodine, to grow and develop normally. This is why iodine is especially important during pregnancy, infancy, and childhood. But it is also important during adult life, for normal metabolism and function. Iodine is ingested in several chemical forms. Iodide is rapidly and nearly completely absorbed in the stomach and duodenum. Iodate, widely used in salt iodization, is reduced in the gut and absorbed as iodide. In healthy adults, the absorption of iodide is >90%. Organically-bound iodine is typically digested and the released iodide absorbed, but some forms may be absorbed intact; for example, about 70% of an oral dose of thyroxine (T4), is absorbed intact. Iodine is cleared from the circulation mainly by the thyroid and kidney, and while renal iodine clearance is fairly constant, thyroid clearance varies with iodine intake. In conditions of adequate iodine supply, about 10% of absorbed iodine is taken up by the thyroid. In chronic iodine deficiency, this fraction can exceed 80%. During lactation, the mammary gland concentrates iodine and secretes it into breast milk to provide for the newborn. Iodine in the blood is turned over rapidly; under normal circumstances, plasma iodine has a half-life of about 10 hours, but this is shortened if the thyroid is overactive, as in iodine deficiency or hyperthyroidism. The body of a healthy adult contains 10 to 20 mg of iodine, of which 70 to 80% is in the thyroid. 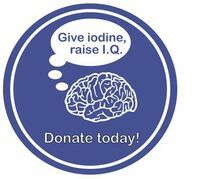 In chronic iodine deficiency, the iodine content of the thyroid may fall to <20 micrograms. In iodine-sufficient areas, the adult thyroid traps about 60 micrograms of iodine/day to balance losses and maintain thyroid hormone synthesis. A transmembrane protein in the basolateral membrane, the sodium/iodide symporter (NIS), transfers iodide into the thyroid at a concentration gradient 20 to 50 times that of plasma. At the apical surface of the thyrocyte, the enzymes thyroperoxidase (TPO) and hydrogen peroxide oxidize iodide and attach it to tyrosyl residues on thyroglobulin, to produce monoiodotyrosine (MIT) and diiodotyrosine (DIT), the precursors of thyroid hormone. TPO then catalyzes the coupling of the phenyl groups of the iodotyrosines through a di-ether bridge to form the thyroid hormones. Linkage of two DIT molecules produces T4, and linkage of a MIT and DIT produces triiodothyronine (T3). Thus, T3 is structurally identical to T4 but has one less iodine (at the 5' position on the outer ring). Iodine comprises 65% and 59% of the weights of T4 and T3, respectively. In the thyroid, mature Tg, containing 0.1 to 1.0% of its weight as iodine, is stored extracellularly in the luminal colloid of the thyroid follicle. After endocytosis, endosomal and lysosomal proteases digest Tg and release T4 and T3 into the circulation. Degradation of T4 and T3 in the periphery—the half-life of circulating T4 is 5-8 days and for T3, 1.5 to 3 days—releases iodine that enters the plasma iodine pool and can be taken up by the thyroid or excreted by the kidney. More than 90% of ingested iodine is ultimately excreted in the urine, with only a small amount appearing in the feces. 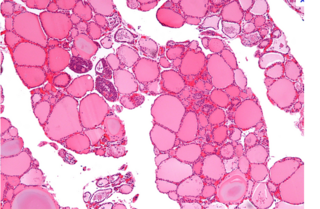 Thyroid cells produce and store thyroid hormones before secretion into the bloodstream. Thyroid hormone regulates a variety of physiologic processes, including reproductive function, growth, and development. During pregnancy, thyroid hormone crosses the placenta to the fetus early in the first trimester, before the fetal thyroid is functioning. In the developing brain, it influences cell growth and migration. It also promotes growth and maturation of peripheral tissues and the skeleton. Thyroid hormone increase energy metabolism in most tissues, and raises the basal metabolic rate. Other physiologic functions of iodine are less well-defined: it may influence fibrocystic breast disease, play a role in immune response, and modify risk for gastric cancer.